When Blackmagic Design unveiled Davinci Resolve 12 a couple years ago at NAB 2015, the company raised lots of eyebrows with what it presented as a full-fledged NLE for video editing from start to finish with all the power of Resolve’s color grading tools in it as well. 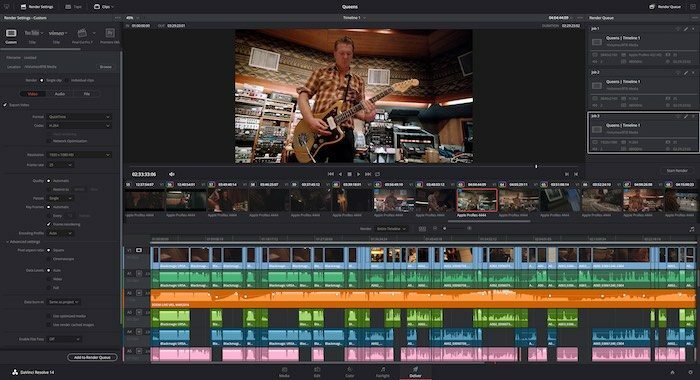 It had a dot-five upgrade last year to give us Resolve 12.5 and this year gets a full version-and-a-half jump with an impressive set of new features. 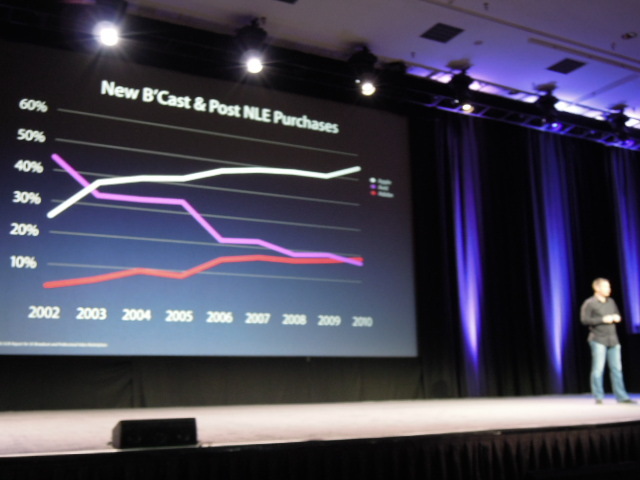 The NLE market has been a bloodbath since Apple announced Final Cut Pro X in 2011. I remember Apple mocking Adobe at the Supermeet before it announced FCP X by saying Adobe was in a race for second place with Avid. I’m still amazed that no one at Apple pumped the brakes long enough to recognize that FCP X was gift-wrapping pole position for Adobe’s Premiere Pro. Now, Adobe offers nothing but a subscription option for Premiere Pro, which it bundles with its other software programs for $50 per month. Now, Apple and everyone else is playing for second place in the pro NLE market. If anything, Blackmagic Design is a disruptor. While there have been plenty of hardware hiccups along the way, BMD’s cinema cameras came in at much lower price points at the time of launch than the rest of the market. It’s switchers and other live video production equipment make professional video production within reach for markets in which it was previously not accessible. 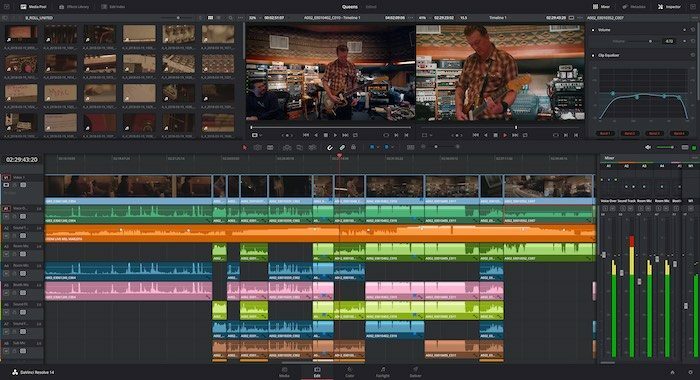 Davinci Resolve has even been available with a free version for several years now, which is largely the same as the premium version of the application except for a few high-end and collaboration features. In addition to all of the advancements brought this year in Resolve 14, Blackmagic is lowering the price of the premium version from $999 to $299, which is the same price as Final Cut Pro X. Moreover, Blackmagic claims a 10x performance improvement with better threading and GPU pipelining, lower latency, much faster UI refresh rates, support for Apple Metal and more. We should see less restrictive hardware requirements and should be able to edit 4K video on a laptop now. There are plenty of smaller editing tweaks but the speed improvement is the biggest news on the editing side of things. The major jump for Resolve 14, however, is in the audio editing department. Last year, Blackmagic purchased Fairlight for its decades-worth of audio mixing tech development. In about six month’s time, Blackmagic has built Fairlight’s core into Davinci Resolve. Now, we have a a massive set of professional audio tools for recording, editing and sweetening, professional bussing, mixing and routing, and multi-format mastering to 3D audio formats such as 5.1, 7.1, Dolby and even 22.2. 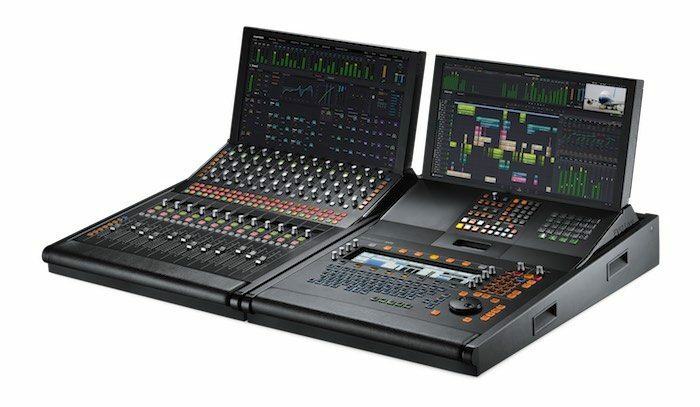 In addition to the software upgrades, BMD is putting out new modular audio desks that run Davinci Resolve for tracking and editing audio. 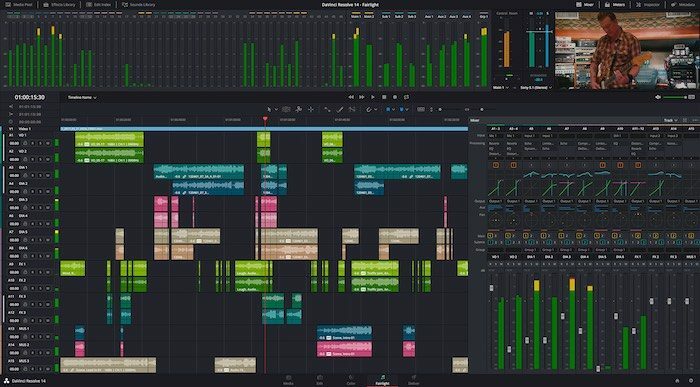 Some of the biggest news from Adobe at NAB is the revamped audio tools in Premiere. It’s almost like Blackmagic is trying to one-up Adobe before it is even in the same ballpark of Adobe’s market share. Ask Sony how that works. There are also several new collaboration features that allow multiple editors and colorists to work simultaneously in the same project. You can learn more about this and the other new features for Resolve 14 over on BMD’s website. The public beta is available today for free if you want to check it out for yourself. It’s available for Mac, Windows and Linux. Legendary Fairlight audio is now fully built into the DaVinci Resolve 14 application itself. Fairlight is famous for being used at the world’s highest end studios for audio post on film and television. Fairlight is known for both its superior sound quality and its speed. Customers get a massive set of professional audio tools for recording, editing and sweetening, professional bussing, mixing and routing, and multi format mastering to 3D audio formats such as 5.1, 7.1, Dolby and even 22.2. The state of the art, super low latency audio engine is designed to work with 192kHz 96-bit audio and delivers up to 1,000 tracks with real time EQ, dynamics processing and plug-ins on every track when used with the Fairlight Audio Accelerator. Plus the new Fairlight audio can record up to 96 channels while simultaneously playing back up to 150 audio channels, while mixing it all in real time! There simply is no other software available with this level of dedicated audio power. 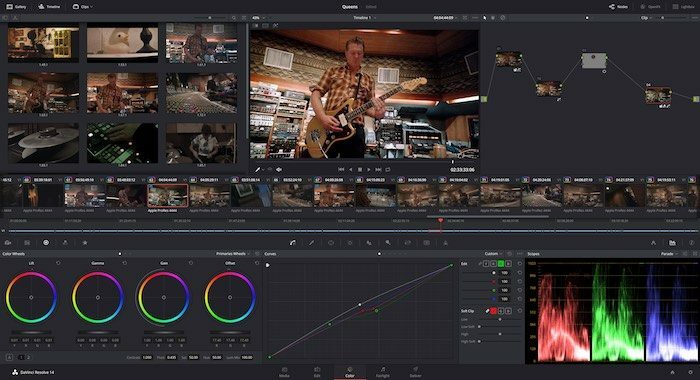 Blackmagic Design also announced a price reduction for DaVinci Resolve Studio from $999 to only $299. It costs less than most annual cloud based subscription plans, making DaVinci Resolve more affordable to more customers. The free version of DaVici Resolve is also available with the same powerful new editing and audio post production features. The $299 DaVinci Resolve 14 Studio version adds the new collaborative multi user tools, over 20 new Resolve FX including the advanced face enhancement tools, 4K and 120fps project support, stereoscopic 3D, optical quality blur and mist effects, film grain, de-noise tools and much more. Best of all, DaVinci Resolve 14 Studio does not require a connection to the internet or a cloud subscription to work. Worth noting, AVID is also coming out with a MEDIA COMPOSER | FIRST – a free version of Media Composer (their main editing software). Available this summer. As for Adobe – as long as I continue to do motion graphics work, I will be with Adobe and Premiere Pro as my main editing software. I’ll dabble with alternatives on some pet projects when I can, but at the end of the day I need After Effects, Illustrator, Photoshop, and even Acrobat on an almost daily basis. With Premiere Pro “bundled” in the same package, just makes total sense to stick with it and makes my workflow that much easier and faster. Media Encoder is phenomenal and very fast compared to other options out there. Audition has become a better tool over the years and does the job, but still reminds me of Cool Edit Pro too much. Will Audition ever take over Pro Tools or Logic? Doubtful. Also worth noting that NO ONE seems to report these days… Adobe Premiere Elements is full-fledged editing software without subscription. You can get a bundle with Photoshop Elements for under $100 total. Would I use this as a professional? No. But this does get people’s feet wet with full Adobe software. Good post. I’ll try anything that will allow me to avoid getting sucked into Adobe’s rental scheme.